The Shift Your Shopping Spree! One lucky winner will receive $500 in gift certificates from their choice of Monadnock Buy Local member businesses. Register for the Shift Your Shopping Spree online: https://monadnocklocal.org/register. Submit your receipts for purchases made at locally owned businesses from November 1, 2015 – December 31, 2015 with your name and phone number to us via mail, email or text. You will receive one entry for each receipt mailed to Monadnock Buy Local and postmarked before January 1, 2016. A winner will be drawn at random on Monday, January 11, 2016. 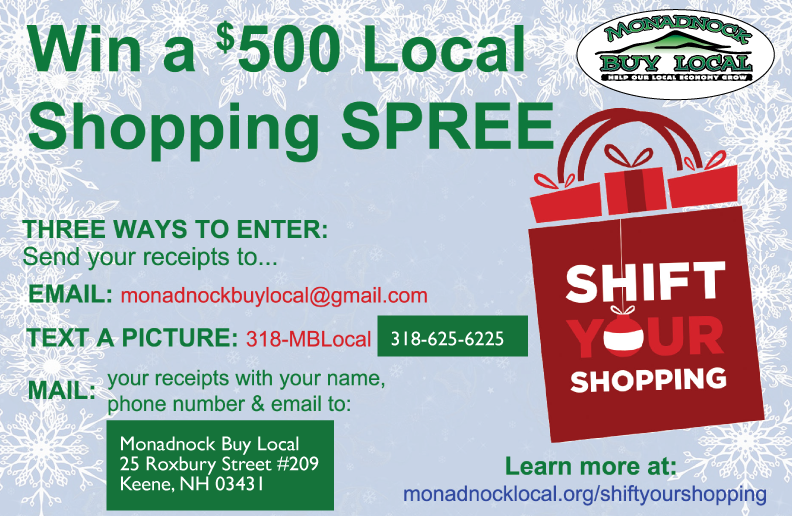 This contest is part of the Shift Your Shopping annual campaign sponsored by Monadnock Buy Local which encourages residents to shop at locally owned businesses during the holidays to grow our local economy and strengthen our community. Need ideas for how to Shift Your Shopping? Check out Monadnock Buy Local’s Online Member Directory.